Available from Queensland, we have special pricing on Radikal Darts Electronic Dart Machines. 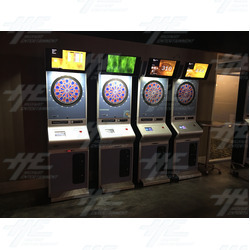 Radikal Darts revolutionized the electronic dart machine industry offering dual monitors and cameras, lazer distance for players, and offline and online tournament play. Still in operation in Queensland venue, we have available 4 machines which have already been discounted for quick pickup, with further bonus - purchase all 4 machines and we will include another parts machine at no cost. For photos of the Radikal Darts electronic dart machines, please follow this link.